Don’t miss out on these sweetheart deals!! Offer ends February 29th, 2016. 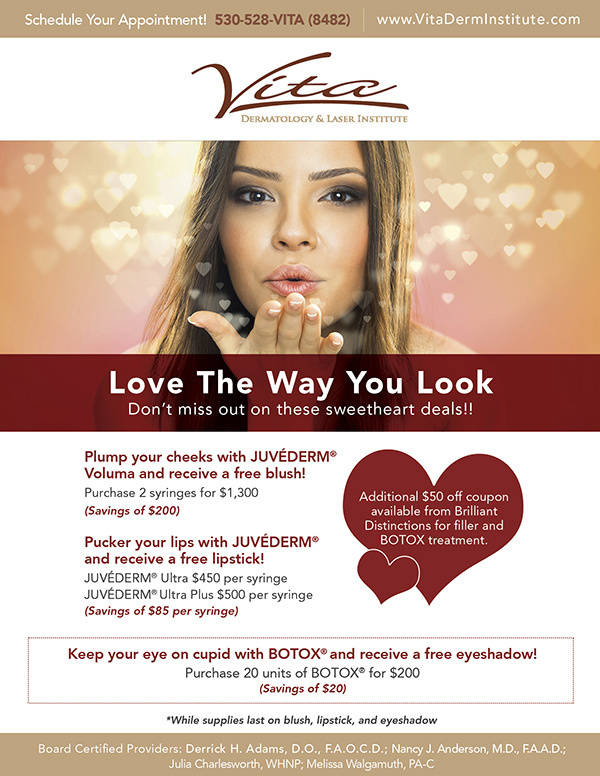 • Plump your cheeks with JUVÉDERM® Voluma and receive a free blush! • Pucker your lips with JUVÉDERM® and receive a free lipstick! • Keep your eye on cupid with BOTOX® and receive a free eyeshadow! Additional $50 off coupon available from Brilliant Distinctions for filler and BOTOX treatment. Voluma is the longest lasting filler that gives a very natural appearing result, and is effective for lifting and replacing volume of the mid face. Botox offers an affordable way to reduce lines, wrinkles, and crow’s feet. Many can experience a more youthful appearance to their skin as a result of Botox. JUVÉDERM® can reduce wrinkles and give skin a younger appearance.